Easily capture and manage ideas, stories, & requirements. Manage product hierarchies and share roadmaps and plans. Organize products and releases into product families, portfolios and more. Show product plans on a timeline to share with customers, teams, and executives. Capture and score and rank ideas from customers, team members, and business partners. Real-time dashboards and printable, shareable, reports. You can always get your data in and out of OneDesk if you need to manipulate it in a spreadsheet or document. Centralize requirements management activities. Trace requirements to customers and initiatives. A complete toolkit to capture feedback and ideas from customers, team members and business partners including a website portal and email capture. Take each idea through a defined life-cycle to ensure nothing falls through the cracks. 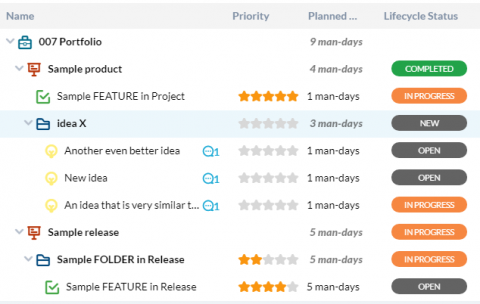 Generate your product, release, portfolio, or project roadmaps dynamically. Accurately analyze past release information and plan for future releases. Develop, manage, and assign requirements from one application. 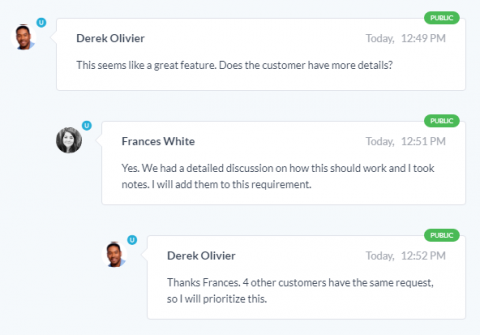 Easily discuss, elaborate and share supporting documents with product teams. Use the prioritization tool to make informed, validated decisions about new features and product ideas. Score and compare across weighted metrics including: Popularity, Priority, ROI and Ease-of-Effort. 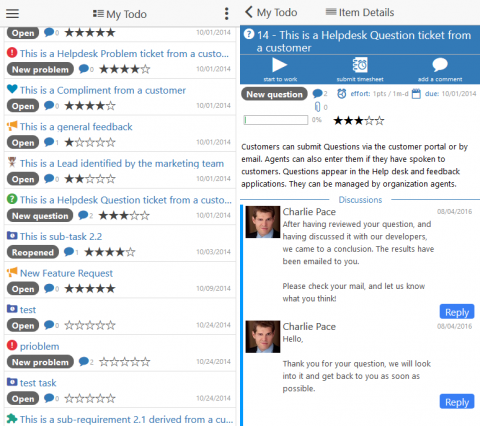 Discuss and share project and product details with internal team members or customers. Address stakeholders’ concerns before work starts. Create product hierarchies and easily plan out and manage multiple products, product families, releases, features, components, modules or whatever else you need to manage. OneDesk adapts to your product structure and naming conventions. Share your product plans with confidence at your next meeting. Easily import and export data and create reports in just a few clicks. The OneDesk mobile app gives users access to their OneDesk account on the go. Your team can discuss, update and log timesheets on tasks and tickets, directly from their phone. It even has a built-in work timer.